It is the most common biliary tract cancer and is the fifth leading gastrointestinal malignancy in the United States. It produces symptoms late in the course of the disease, disseminates rapidly from the primary site, and responds infrequently to nonsurgical therapy. The overall median survival for all patients is less than 6 months. The disease is up to five times more common in females. It is usually associated with gallstones, although few patients with gallstones actually develop gallbladder cancer. Ministry of Health and Family Welfare, Government of India has issued the Standard Treatment Guidelines for Gall Bladder cancer. 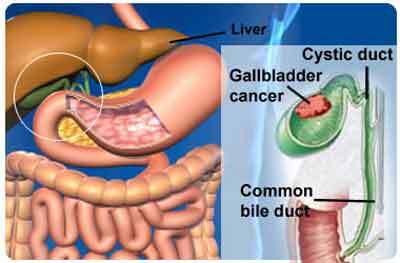 The reported crude rate for gallbladder cancer in India is 1/100,000. The comparison of different population based cancer registries indicates that GB cancer varies in different regions. The reported incidence ranged from 10/1, 00, 000 in Delhi to 2- 3/1, 00, 0 00 in South India. Xanthogranulomatous cholecystitis is a relatively rare inflammatory condition of the gallbladder, requires to be differentiated from GB cancer. Characteristic findings on the CT scan are intramural hypodense nodules. CA 19-9 levels may be normal, and FDG-PET scan may be negative. Mid bile duct cholangiocarcinoma may simulate a GB cancer and can be differentiated by optimal cholangiography as can Mirizzi syndrome. There is no way to prevent gallbladder cancer, however its risk may be decreased by maintaining healthy weight, avoiding tobacco and having surgery for high risk conditions such as patients with large stones, porcelain gallbladder, polyps, anomalous pancreatobiliary ductal union, and those belonging to certain races such as Pima Indians. Patients with gallbladder cancer are often initially asymptomatic. Nonspecific symptoms of abdominal pain and weight loss may mimic the symptoms of benign gallbladder disease. Jaundice is an ominous sign in patients with gallbladder cancer and usually indicates advanced disease. A palpable gallbladder may be found on examination. Ultrasonography is usually the first investigation in suspected gallbladder disease. Findings suggestive of cancer include asymmetric wall thickening, discontinuous mucosa, echogenic mucosa, submucosal echolucency, or mass lesion. Doppler examination may help to assess the blood flow through areas of mucosal abnormalities and also the patency of the regional vasculature (hepatic artery and portal vein. CT scan is currently the gold standard in imaging of a suspected GB cancer and can show the mass lesion, extension, vascular involvement, nodal disease and metastasis. Magnetic resonance imaging has the advantage of no radiation plus the opportunity to have a all information in one single investigation that provides cross-sectional images of the tumour, extension, nodal disease , cholangiography and angiography. Laparoscopic evaluation should be considered before proceeding to open resection as up to 55% may have peritoneal secondaries. Biopsy is not essential for tumours deemed resectable by imaging, however for unresectable disease planned for nonsurgical therapy histologic confirmation is mandatory. Radical re-resection (after a complete staging including laparoscopy demonstrating resectability) is recommended for patients with incidental gallbladder carcinoma stage T1b (tumour invades muscle layer) or greater. Patients with T1a tumours (tumour invades lamina propria) do not further benefit from re-resection if the gallbladder were removed intact and should be observed only. Incidentally detected tumours at surgery should be confirmed by frozen section biopsy and full evaluation should be performed using intraoperative ultrasound. Surgery is converted to open resection with en-bloc hepatic resection and lymphadenectomy with or without bile duct resection. Surgical resection is the only potentially curative treatment for preoperatively diagnosed resectable cancer. Resection is an extended cholecystectomy which includes cholecystectomy, en=bloc hepatic resection and lymphadenectomy (porta hepatis, gastrohepatic ligament, retroduodenal) with or without bile duct excision. Involvement of the interaortocaval node is considered as synonymous of disseminated disease, and if this lymph node is positive at frozen section, curative resection must be abandoned. Bile duct resection is considered for cystic duct lesions or invasion of the bile duct or for clearance of bulky nodes. It may also be indicated when the bile duct is itself involved by tumour. Surgery may also involve removal of adjacent organs such as the duodenum, colon, stomach, and pancreas to achieve RO resection, as negative margins is the most important determinant of survival. Resectable advanced disease diagnosed at surgery may be considered for operative treatment. Biliary enteric bypass, however if diagnosed prior to surgery should be considered for endoscopic or percutaneous biliary drainage. Adjuvant and palliative chemotherapy has limited role and Gemcitabine based chemotherapy and 5FU based chemo radiation can be considered in patients with god performance status. Any elderly patient with right upper abdominal pain and weight loss should be evaluated for gallbladder cancer and the diagnosis confirmed by imaging. When a patient reports with gall stones (symptomatic or asymptomatic), care should be taken in reviewing the clinical history and also the ultrasound examination. If there is asymmetric gall bladder wall thickening, or mass lesion, or jaundice, then the patient needs more extensive evaluation in a tertiary care center. Since the best opportunity for long term cure of patients is in R0 resection (complete resection with negative margins), preoperative definition of tumour extent is critical, and patients must be managed in a tertiary care center. All patients for extended cholecystectomy should be referred to specialist centre. Any elderly patient with right upper abdominal pain and weight loss should be evaluated for gallbladder cancer and the diagnosis confirmed by imaging.